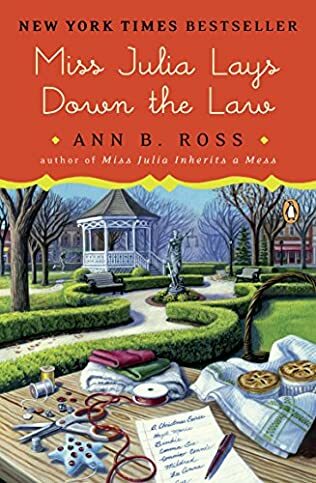 Reading the Miss Julia books in order by Ann B. Ross will bring much joy to any cozy mystery fans. Miss Julia is often funny, and her character develops naturally from book to book. She is a member of the local church, proper Presbyterian lady, and she takes her religious quite seriously. So when, in Miss Julia Speaks Her Mind (the first book in the series) her deceased husband, Wesley Lloyd, turned out to not only have a mistress but also a child, she realizes that the right thing to do is take the two in when they appear at her doorsteps. And so a new family is born. 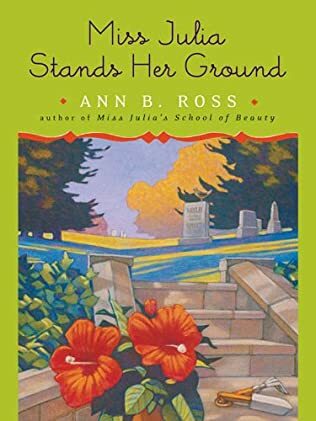 Here is the Miss Julia series in order by cozy mystery author Ann B. Ross. Miss Julia is an elderly widow who is living in Abbotsville, North Carolina. She is one of the few widows who not only learned to live with her no longer having a husband but also accepted and even embraced her widowhood. So much, in fact, that she is constantly telling others that it’s ok to be a widow, while also showing them the many benefits from having such a status (money, for example). 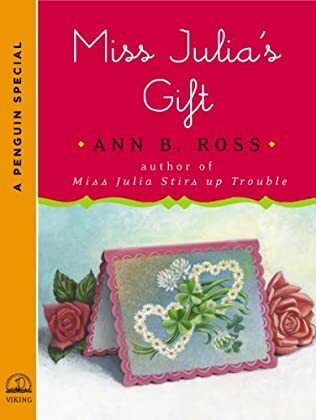 The first book in the series for the Ann B. Roos books, Miss Julia Speaks Her Mind, starts a wonderful journey into the world of this lovely and quirky Southern lady with lots of friends and fun adventures. In book five, Miss Julia Meets Her Match, she does get married once again (not many women at her age are so lucky) to Sam Murdoch, an admirer who is the sweetest person on Earth. She has a strong wit about herself and when it comes to solving the cases she comes across, she is always in the thick of it. She has a spunky and determined personality and is much tougher than she looks. Being a product of the South, she is a typical sweet Southern lady, a true sharp-tongued southern belle. Her character is one that many people around her love. She is quite popular with her neighbors, who often come to her for advice on all sorts of things. 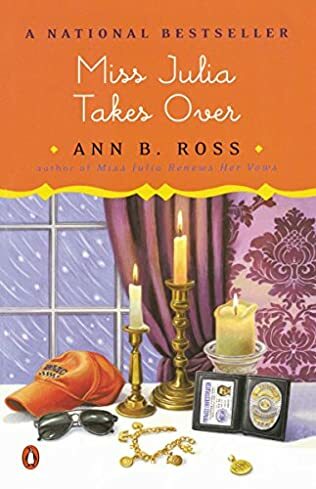 Also, she knows how to keep other people’s secrets, something that she has the chance to prove in several of Ann B. Ross’s books. However, she is not afraid to speak her mind when the occasion calls for it (see the title of the first book for a good example). After all, freedom of speech is still well and alive in America. She is also fearless and often gets into all sorts of crazy adventures that could even become dangerous to her. Yet, in a few of the books, it is clear that Miss Julia is also rather naive and this weakness often brings her great problems. This naivety shows from the very first book, where a part of the mystery is, indeed, her gullibility. 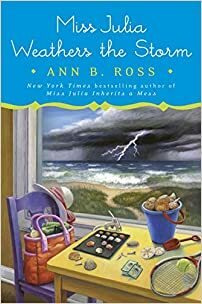 In Miss Julia Weathers the Storm, she once again gets her nose into other people’s businesses and gets herself in the craziest of situations. Miss Julia now feels she needs a vacation, so she grabs her family and goes to the beach for two weeks after Sam renting a huge beach house for all of them. Of course, she won’t be spending all her two weeks on the beach because there are things she needs to take care of, especially since several mysterious $100 bills wash up the shore, followed by a hurricane that doesn’t want to leave them to enjoy their holidays in peace. So once the family is home again, they notice a black SUV that is seemingly following them. The latest Miss Julia story is, once again, hilarious to boot, and fun entertainment. The Miss Julia series of books is an enjoyable light, cozy mystery series. The author often mentioned that, to her, Miss Julia is like a dear friend. While none of the Mis Julia Books reached the status of a bestseller #1, several of the books have been on the New York Times Extended Bestseller’s List over the years. Ann B. Ross says that for her, knowing that the books reach all her fans over and over again, is satisfaction enough. As to the mystery in the book, it is very light. I mean very, very light. There is hardly any suspense and you won’t have edge-of-your-seat moments while reading it. Often you figure out what is going on before Miss Julia. Sometimes she keeps reminding me of Angela Lansbury but in a much lighter and humorous setting. I actually see Angela’s face in front of my eyes when I read one of the Miss Julia books. 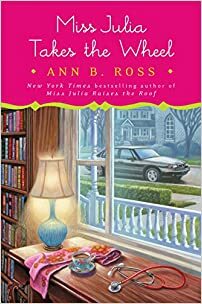 What I enjoy maybe most about reading Miss Julia series in chronological order is that over the years and over the course of the books, she has managed to create a real home for herself and managed to surround herself with friends who became her real, true family. There is much love in these books and lots of warm, fuzzy feelings when reading the Miss Julia series. So if you are into serious mysteries, this book might not be for you. 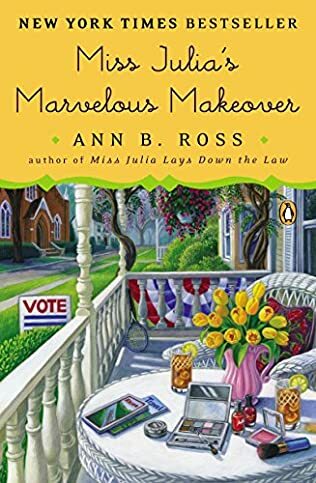 But if you want to have a fun few hours where you can heartily laugh, solve the cases along with Miss Julia while sipping on your favorite beverage, I recommend picking up the Miss Julia series with all my heart because the Ann B. Ross books are truly wonderful. have read them all , except the last. (2019)-Love them all. You and Fanny Flagg are 2 of my favorites. KEEP WRITING, please. I just want to say I love all your books and need the good laugh they provide. Not much else makes me laugh these days. Please, please keep writing. Loved these books. Read them all within three months time and am hoping that there will be others to follow. I love the suspense of what Miss Julia is getting into next and am sorry that I finished all of them so quickly. Best books I have ever read. times I started & finished the same day. Thank you for giving me such pleasure!! Love reading Miss Julia books and wonder if one will be released in 2018. Yes, it is called Miss Julia Raises the Roof and it will be published in March 2018. The book cover is shown at the very top of this page under the heading New Miss Julia Book.